I‘ve just finished this ACEO whimsical oil painting. 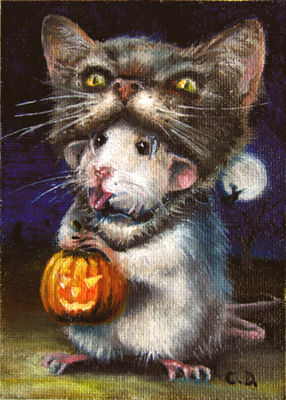 It depicts a cute little rat who trick-or-treating on the Halloween night costumed as a scary thing for the rat kind : a cute pussycat ! :~) He has in his paws a carved pumpkin for Halloween. It is supposed to be scary but the piece of force is that horror Halloween cat mask. Someone who looks with more attention would see a witch flying her broom over the Moon. This original fine art ACEO artcard is painted with oil paints of the best quality on a canvas panel. It took me several hours to finish it because of the fine details in the painting. The art miniature painting’s size is 2.5 x 3.5 inches as all the ACEO has. Daniel, I’m a big fan of Halloween and a big fan of irony… this is too good! Oh, Thank you Gary! Your landscape are good to!